Industrial Noise Control | Manufacturing Noise Control | O'Neill Engineered Systems, Inc.
Industrial facilities and manufacturing plants are among the harshest work environments for employees due to excessive noise levels. Culprits can include stamping presses, granulators, generators, blowers, air handling units, compressors, and vacuum pumps, all of which call for some degree of noise reduction to protect workers. Effective noise control solutions can include isolating equipment with machine noise enclosures or barriers, isolating employees with modular in-plant offices, or a combination of both. Contact OES today with your industrial soundproofing requests. Process and machine sound enclosures are critical for creating safer noise levels & a better work environment for those in industrial, process, and manufacturing facilities. Customizable modular offices protect employees from distracting noisy environments. 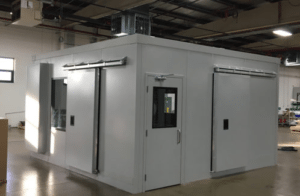 Our modular in-plant offices utilize the best in noise control technology, making them ideal for industrial, process & manufacturing facilities.